I found a project on Github named mobile-rr, by a user called idolpx. His project includes a little wifi-chip that includes a piezo buzzer, and when people connect they are promised free wifi, but instead of getting access to the internet, they are shown a video of Rick Astley singing “Never gonna give you up”. This is a so called Rickrolling prank, and if you have been living under a rock the past decade, the prank involves bait-and-switch where a link on a webpage promises to bring the user to some unrelated material, and bam! they are now listening to the tunes of Rick Astley and they can consider themselves rickrolled. WeMos D1 Mini Pro ESP8266, 6.99 GBP. 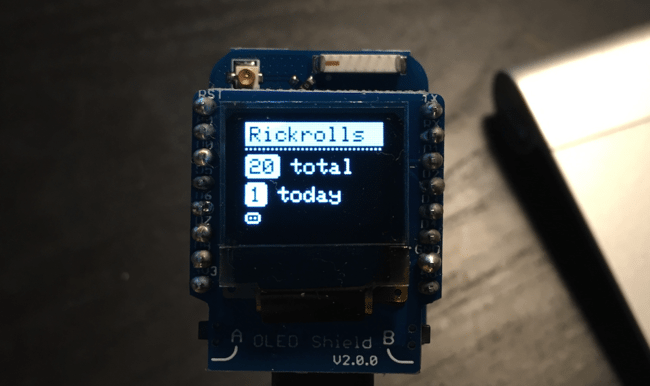 WEMOS D1 Mini OLED-shield, 9.00 GBP.